One of the most popular health food now a days is sweet potato fries. Sweet potato fries are lower in glycemic load than white potatoes and they are much better for blood sugar levels and sweet potatoes are loaded with nutrients like fiber, vitamin C, and beta-carotene. You can grow them in your own backyard and they are so delicious. For anyone that is used to eating regular fries this is a great alternative. 2. 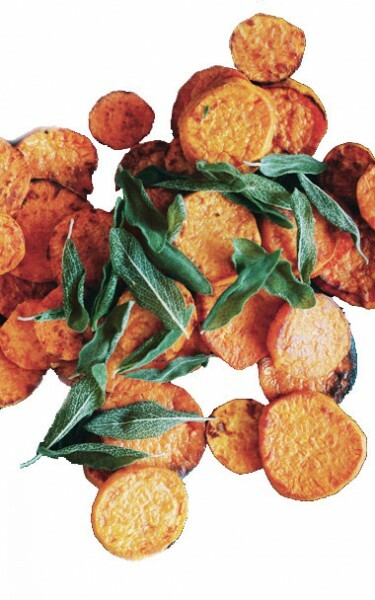 Cut the sweet potatoes into thin sliced round chips approx 1/4 inches wide. 3. Take a big zip lock bag and put the cut pieces inside. Pour the 2/3 cup olive oil, sea salt, oregano, paprika and black pepper inside the bag. 4. Shake the bag until all pieces are covered evenly with the ingredients. 5. Spread the potatoes out evenly on a non-stick baking sheet if there is room. 6. Bake for 15 minutes on each side. They should be a light brown color after the full 30 minutes. Be careful when turning because sweet potato is soft. 7. Heat 1/3 cup of oil in a small skillet over medium-high heat until it shimmers. Fry all the sage leaves in 2 batches, stirring until crisp. 30 seconds to 1 minute per batch should be fine. Transfer the sage with a slotted spoon to paper towels to drain the oil. Place them over the sweet potato once they come out of the oven. Your baking pan should not be “over crowded” and that the chips should be spread out as much as possible. Use two baking sheets if necessary. Bake the sweet potato fries by them self. Do not bake them with other foods in the oven. Instead of a non-stick pan try using aluminum foil (shiny side up). This seems to make them turn out crispier. Using parchment paper or foil also prevents the fries from sticking to the pan. After baking them for the full amount of time (30 mins), if the fries are not as crispy as you’d like, take them out of the oven and loosen them. Put them back in the other for another 5 minutes or until a desired brown. If you want them extra crispy try broiling them for another 2 minutes. But be careful as they can brown very fast. Keep an eye on them if you choose to broil the sweet potatoes.